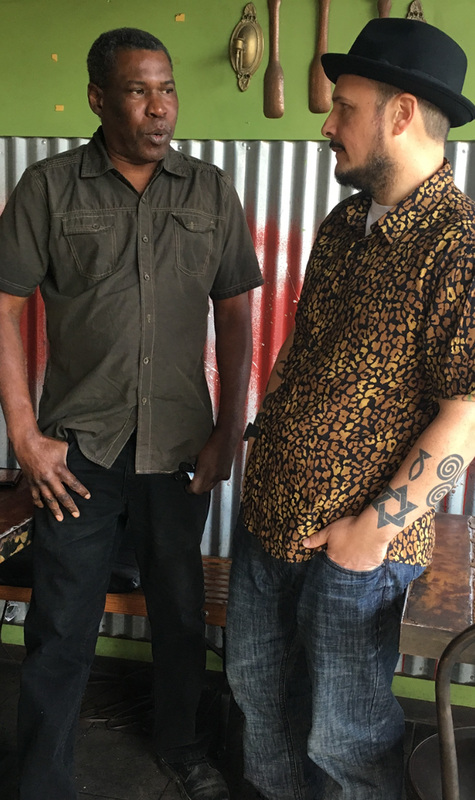 Q: Now [in the first part of this interview] we mentioned briefly King Tubby’s famous Roots of Dub album. That’s an album that there’s no question about whether Tubby mixed it – he did. Scientist: It’s a big inspiration until today to me. Every time I hear that album it carries me right back to day one. Q: In a 2012 interview with Boomshots, you were asked whether Tubby’s “Roots of Dub” [album], or Lee Scratch Perry’s Blackboard Jungle Dub was the first dub album in the world. And at the time, you said, candidly, that you weren’t sure, but that you were sure [that] Tubby’s “Roots of Dub” album was the most known. 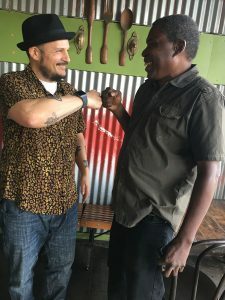 I don’t want to revisit the age-old debate about which was the first dub album – both are terrific – but [I want to ask you this question] because I interviewed legendary percussionist Larry McDonald recently[, in October,] after he and Scratch played at the Dub Club [in Los Angeles] to celebrate the 45th Anniversary of the Blackboard Jungle Dub’s release. And [so] I asked Larry: How involved was King Tubby in the final product that is the Blackboard Jungle Dub? 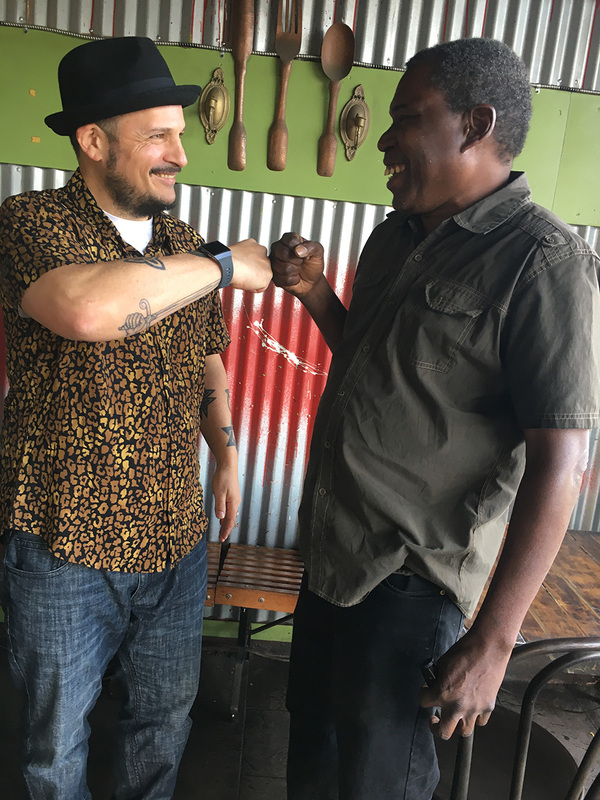 As some people have suggested – I believe David Katz[, for example,] the biographer of Lee Scratch Perry – that Scratch has downplayed Tubby’s participation in the mix of that [famous dub] album. And Larry McDonald said specifically that he didn’t know, but that Philip Smart might know, though [Philip Smart] has passed on. And then, Larry said, “You know what, Scientist might know the answer to that.” So here I am with you and it’s a great time to ask. Scientist: Candidly, I have to say, I don’t know. If I hear it – but look at what makes sense. Why is Scratch not mixing any albums now? If I hear it, I would have to hear it to remember it, I could tell you if it has King Tubby’s signature. Q: Well hopefully, sooner rather than later, when we meet again, I can play it for you or ask you before we meet to listen to it closely. Because there has been a lot of speculation about the Blackboard Jungle Dub and how much of a hand King Tubby had in it. Scientist: Well I met Scratch at Tubby’s. I know his wife, Pauline. Scientist: His ex-wife, right, Pauline. 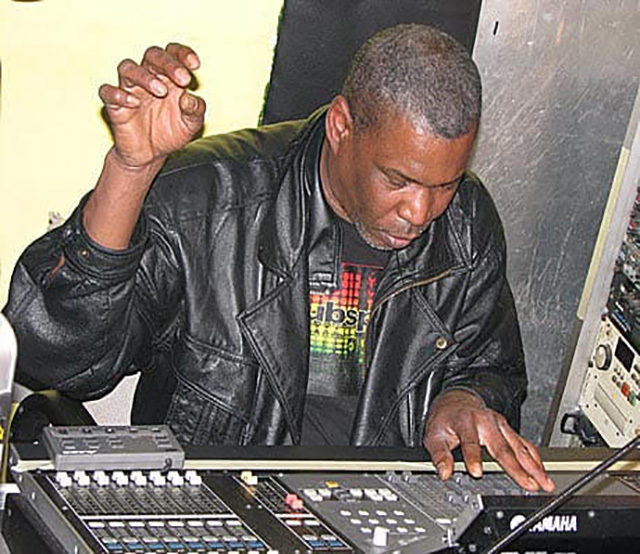 Scratch was – yes, Scratch was responsible for [the rise of legends like] Junior Byles, Bob Marley and [many other performers]. As far as the Blackboard Jungle Dub, I would have to hear it. Q: Okay, we’ll revisit this question then. Q: Do you maintain contact still with any of the surviving members of the Roots Radics, the session band you had so many hits with? I believe Flabba Holt is playing bass, and that Dwight Pinckney is playing guitar, for Israel Vibrations these days? And I believe percussionist Christopher “Sky Juice” Blake may still be alive, too? And I guess I wanted to ask you if you thought these would be good people for me to talk to? Scientist: Yes, I’m still in touch with Flabba. (Calling Flabba on his cell phone.) Yo, Flabba? Scientist: Yeah, we’re doing an interview here, and I was trying to set the record straight about what you did. Q: Hey Mr. Holt! This is Steve Cooper. 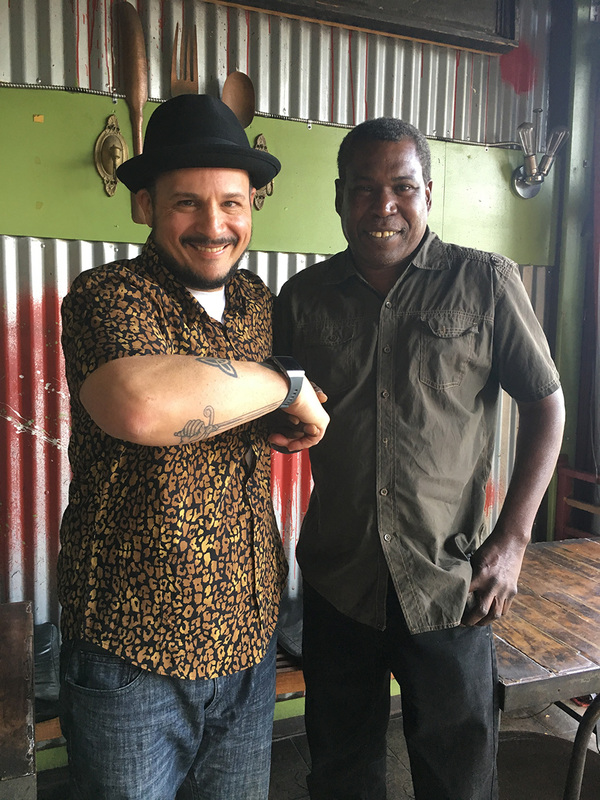 I write about reggae music for Reggae Vibes and several other publications, and someday, I [plan] to write a book about reggae music. And [so] I’m hoping you and I will get together [for an interview]. 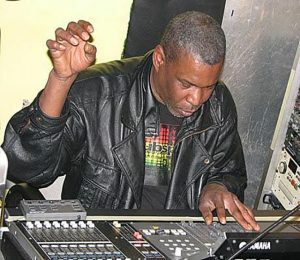 Right now I’m interviewing Scientist[, in part,] about some of the misconceptions that exist about the mixing that was done at King Tubby’s studio. Q: Yeah, I do. But one last thing I want to ask before we say goodbye is, what is it like working with Scientist? How was it that you guys were able to produce such crucial music together, and to really make dub explode in ways that no one could ever imagine? Q: Yes. Give thanks, Mr. Holt! (handing phone back to Scientist who says goodbye and hangs it up.) Now [two] people who follow me on Twitter, “Gong’s Pinnacle” (“@RasThaFarEye”) and Dominic Ali (“@domali3”), wanted me to ask you how you felt about dub music being more popular and much more heavily produced in countries other than Jamaica, where it was born. Of course, I know you’ve discussed this many times in other interviews – including recently [in the UK] with DJ 745 – but it’s such an important issue when it comes to celebrating Jamaican culture, I feel it’s worth asking if you have anything more you’d like to say on the subject? Scientist: It’s a disgrace. Dub comes from everywhere but Jamaica where it was created. And when you look at what makes sense, I am not there anymore. Tubbys got murdered. And when you look at what makes sense, “Princess” is still there [referring derogatively to King Jammy]. So why is the Princess not making any more dub albums? Why? And here’s why: There is a formula – and don’t get me wrong, you have the musicians like Flabba Holt, they are very important. But the engineering technique – that I didn’t really show anyone else – everyone back there [in Jamaica] was trying to look over my shoulder, and trying to figure out the technique, including King Tubbys. I didn’t choose it, it chose me. After I left, the day I left [the famous] Channel One [studio in Jamaica], it closed the next week. Or the following week. Q: You went to Tuff Gong [Studios]? Scientist: Yeah. And then Tuff Gong became the place where everybody and their grandmother who never worked there, started to work. Q: — whereas they used to go to Channel One [to record], now they were coming to Tuff Gong. Q: Because you had moved there? Scientist: That’s the only reason and what makes sense. Because here’s what happened: When I used to leave Channel One – I used to just go up there just to hang out with the Wailers, with Carly and dem, and smoke weed – and one day I was in the studio and [the late] Willie Lindo said to me, “Look here, man, I see you with that smile. You have something that you know you’re not telling anybody.” And I was there smiling. And him say, “What is it, man? Come on, tell me! Tell me what it is.” And I say, here’s what you do Willie Lindo: “Book the studio, and I will show you. 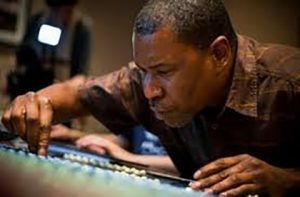 And I come like this, “See this button right here, Willie Lindo?” They all been mixing Bob Marley, everybody’s song in “monitor mode.” The [mixing] console has several different modes and positions. And bingo! Then they start to get the same type of sound like we got at Channel One. And then everybody and their grandmother, Yabby You, everybody, and no disrespect to Errol Brown, but he was kinda put in an embarrassing position as chief [engineer at Tuff Gong]. As they say, sometimes the best place to hide something is right under somebody’s nose. It was right there all the while. “Click” monitor mode. Click “channel line” position. Click, click, click different positions. You want to do a dub mix? Click, click, click. Well the dub mix is something different. Because I’m an electronics engineer, I know how to manage a console. Q: In your opinion, who are some of the labels, and sound engineers, and others who are producing the cutting edged dub tracks in the world today? [And] where are they based? Scientist: To be honest, I’m the worst person with names, but they’re all based right now in the U.K. They’re taking it and they’re supporting it more than even Jamaica. Q: In a Facebook post [on June 25, 2013, you wrote]: “The current state of technology in the now familiar “digital world” has made it the perfect time to create a new mixing tool specifically suited to the needs of dub and other remix genres. It’s called the ‘Dub Control Mixer.’” Further you wrote, “I’m exploring collaborations with pro-audio manufacturing companies in the design of the new dub control [mixer].” Were you ever able to produce and bring to market the “Dub Control Mixer”? Q: So you are still building it? Scientist: Yeah. [It’s just] the technology keeps changing. Q: Another person on [Twitter], Jadesignlovin’ (@jadesignlovin’), wanted me to ask you if you’ll soon be developing a line of electronics, such as amplifiers (and noted that this question was based on something he understood you to have told [famous dub poet] Mutaburuka in a radio interview during the last year or so)? Scientist: Yes, right when I was leaving to meet with you I was finishing up a circuit board. And the digital technology, it just keeps changing. But at this point, I think I’m at my final design. Q: So we might see it [on the market] in 2019? Scientist: Yeah. Because I have a couple of people that have been patiently waiting. I need to do it, I need to finish it, and the good thing about it [is] when I need to update it, I can update it over the internet. Q: I don’t know how you do all that, that is amazing! Scientist: Yeah. That’s what I’ve been doing, and it’s like pulling teeth out of your head. Q: Two more questions about equipment, and especially for the people who might read this who are “gear heads.” First, in an interview you did with “Space Bomb” records, you talked about how since moving to the U.S., in addition to continuing to create great dub music, you’ve also maintained a business creating mixing boards, amplifiers, and other personalized sound processing equipment. Putting aside the “Dub Mix Controller,” which maybe we’ll see in 2019, are you still doing personalized electronic work for people? Q: Yeah, you talked a little bit [in your recent interview] with DJ 745 about that. Scientist: I’m getting ready to go back to the U.K. again. So that’s where my head is right now, and I need to finish up this digital electronic stuff that I’m doing. Q: [In that same Space Bomb interview you did,] you said that often you would get home from a club, and your day [and night] would continue because you’d still [have to get] on the phone with China to get circuit boards. Are you still having to do that? Q: Has [Trump’s] trade war affected your ability to get circuit boards from China? Scientist: Well here’s what: The U.S. is a very good place. I would rather to be able to do it right in my backyard. Q: To buy the circuit boards in the U.S.? Q: Forcing China to be fairer on trade? Scientist: Yes, because they can sell their cars over here, but we can’t sell our cars over there. Q: Since you mentioned one thing you agree [upon] with Trump, is there anything you want to say [in this interview] about the things you do not agree with Trump [about]? Scientist: Well, let me say this, I came to the United States in 1985 and not one policeman [has] asked me what my name is. I’ve been into all kinds of neighborhoods. I used to live in Woodstock. Not one police officer [ever] asked me what my name is. And I hear, “you’re getting targeted because you’re black.” Okay, why did the police stop you? You’re driving 60 miles an hour in a 25-mile-an-hour zone. That never happened to me, not one time. You have some people that come, and they come with destruction. Q: Come to the U.S. you mean? Scientist: The Dreamers. They don’t have any criminal record. [And even if] they commit a crime, everybody make[s] mistakes. If it’s not a repeated felony – felonies should be looked at differently. I firmly agree that someone who goes through the correctional system, come[s] out, [and] continues to be in the correctional system, then that punishment is appropriate because you don’t learn your lesson. Q: Do you have any particular feelings about the release of reggae star Buju Banton, recently, from having served a lengthy prison sentence in the U.S. for a drug conspiracy case? Recently, he received a hero’s welcome in Jamaica, and there were many different feelings about this. Did you have any particular thoughts about Buju Banton’s release? And further, do you have any desire, or if given the opportunity, would you do any work [in the future] with Buju Banton? Why or Why not? Scientist: Well, everybody’s entitled to a mistake. He probably got caught up. [And it is] kinda screwed up the way the laws are in America and the rest of the world. With certain convictions. When you become an artist – and you, as an attorney, you also know this, you have to pass the bar, but you also have to pass a moral test. Scientist: When you become an artist, you [equally] have a moral responsibility. Because a lot of people now start to listen to you. So what I want Buju to do, is to use his moral responsibilities and try to deter others so that they don’t get caught up in the same trap that he may have gotten caught up in. Q: Part of the controversy surrounding Buju Banton is not just of course the prison sentence [he received, and conviction in the U.S.], but also has to do with previous lyrics of his and songs like “Boom Bye Bye” that some people have said have increased the homophobia that exists in Jamaica. And so that is part of the controversy surrounding Buju Banton. He has renounced [any homophobic views] publicly I believe, and he signed onto an agreement that he was no longer going to use lyrics that disparage gay people. Do you feel that, going forward, Buju Banton has any responsibility with his music to counterbalance any of the negative impact of the homophobia in some of his [earlier] material? Q: You’re gonna catch that rope. Scientist: You’re gonna catch that rope. Scientist: I can tell you the ones I’m not fond of anymore: [anything] analog. There’s no fun anything [in analog]. A digital desk does it all. Q: What are some of the ways that your approach to mixing and creating dub music – in terms of miking instruments, the separation of instruments, the use of effects, working with singers and musicians, touring or giving performances – how has any of that changed or matured over time [for you]? Scientist: After a while it becomes automatic. It’s like I can now do it in my sleep. But make no mistake, dub is just the performance, the engineering technique that enhance[s] the dub comes first, like the proper tonation and balancing of the instruments. That comes first. Then dub is just the musical performance. Q: Before I forget, DJ Selecta Jerry in New Jersey wanted me to ask you: what are a few of the very best albums that everyone who loves dub music should have in their collection? And please, there’s no need for modesty. Q: After interviewing you for his book on dub music, [Professor] Michael Veal concluded: “Using the mixing board as an instrument of spontaneous composition and improvisation, the effectiveness of the dub mix results from the engineer’s ability to de-construct and reconstruct a song’s original architecture while increasing the overall power of the performance through a dynamic of surprise and delayed gratification. The engineer continually tantalizes the listener with glimpses of what they are familiar with, only to keep them out of reach, out of completion.” Do you agree with this characterization of dub music by Professor Veal? Scientist: There’s an art to it. Where you get the person hooked to a certain sequence. And then you keep switching them. And then I develop a technique that – one of the reasons it surpasses the original music is – you never hear it the same way twice. Q: When it’s performed or you mean whenever you hear it? Scientist: Whenever you mix it. If you even record a live performance and you play it back. To the listener, it’s never the same way twice [when] you hear it. Q: You hear different things in the music every time? Q: Before you work on a dub version of an album, for example, when you collaborated with Hempress Sativa on the very, very fabulous release, Scientist Meets Hempress Sativa in Dub, how much time do you first spend listening to the artist’s non-dub tracks, to familiarize yourself with their music, in order to be able to better manipulate the mix? Scientist: No time. Here’s what, to every dub album out there, there’s an “A” side. For example, Barrington Levy. “A” side. And then most of those albums back in the day, they were completed in three or four hours time. So a young up and coming producer like Henry “Junjo” Lawes, that we all were helping, who didn’t really have any money, so we give them an hour or two hours [of] studio time. And guess what? We have to mix the whole album in two hours. And if you talk to Flabba, a lot of times we were just helping out those producers. ‘Cause they didn’t have any money or was not financially capable. Like, for example, “Cocoa Tea.” And they make up the songs. We’d have to record them right there on the spot. And they’d only have two hours total to do the whole record. Because that’s the only money they could afford. So it [wasn’t] a whole lot of back and forth. You have to learn the songs right there and then. Q: There was a lot of celebration in Jamaica due to the recent announcement that reggae music had been added to the United Nation’s Educational, Scientific, and Cultural Organization’s (UNESCO) list of cultural treasures that must be safeguarded. There were a lot of government officials [in Jamaica] who took to social media and other [platforms] to [celebrate] this news about reggae music, highlighting the fact that this happened. Did you have any particular feelings or reactions about either UNESCO’s announcement, or any thoughts or feelings about the reaction by government officials in Jamaica, who, at least in my own personal opinion, have not done enough to support [reggae] music and musicians financially, or actually, in any way. Any thoughts [about this]? Scientist: Yes, I agree with you. The government needs to do more in preserving reggae music. There are three things that bring notice to Jamaica: Rasta, marijuana, and reggae. It’s a disgrace to see an artist like Junior Byles lying in a trash heap. Q: There was a YouTube clip about that circulating recently. Scientist: Yes. It’s a disgrace. King Tubby’s console should have never left Jamaica. The Jamaican government should have preserved it. Q: I heard you talking about that [in your interview] with DJ 745. And this has always been something that has bothered me, and that I’ve asked numerous reggae [artists] about, [this] lack of financial support for reggae music [by the Jamaican government]. And a lot of [different things] have come up in the conversation, including the fact that reggae music has always been Rasta music. And that Rastas in Jamaican society have a long history of being looked down upon. Only recently are they starting to get some [real respect]. And also, not just Rasta, but that it’s poor people’s music. That downtown and uptown [divide]. I often think about reggae star Etana’s song “Wrong Address” [when I have this conversation now]. 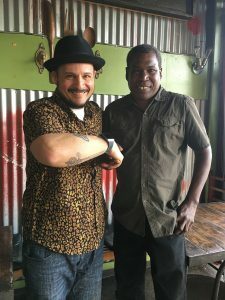 Because that song explains so much for me in terms of the lack of support [for reggae artists]. And it’s confusing to me, because as you said, [reggae music] is what Jamaica is [best] known for. [Jamaica] could make so much [more] profit [from it]. So even if [in Jamaica’s] soul, this is not [what you love], which I find hard to believe, because as Protoje and other reggae stars have told me, even if they don’t say they love reggae music in Jamaica, behind closed doors they’re dancing to Bob Marley. Scientist: Yes. Well, here’s what: Jamaican reggae music [is] the voice of the oppression and colonialism, and injustice. Make no mistake: without dub and reggae, you wouldn’t have all these sub-genres [of music]. There wasn’t any way for speaker manufacturers or amplifier builders to end-test the result of their equipment without reggae. Q: Mr. Brown, I know that you’re gonna be back in the U.K. next year. You have a number of shows lined up with “Mad Professor” [at the Jazz Café]. Are there any other projects or any other endeavors of yours that you’d like all of your many fans around the world to know about and watch out for? Scientist: Yes. Right now my head is at electronics. When I go back to the U.K. next year, I’m gonna be conducting some more “Master Classes.” Like we did in Liverpool. And in Brazil. It was very successful. It shed light on a lot of things, and a lot of misconceptions that people had. So that’s where my head is right now. Q: Can you describe what these “Master Classes” are? Q: What I imagine is like a conference where you teach people what you know about dub music. Q: – the performance. The electronics piece [I mean,] I’m sorry. Scientist: Yeah. Proper miking techniques. One of the bad things that’s been going on since the 1960s is the guitar amplifiers on stage. Scientist: [They’ve] caused so much problems. Q: Because they – they go on fire? Or what? Q: You said “phase shift”? Scientist: “Phase shift,” yeah, that’s an electronic term. Even though it may be 10 milliseconds out, so when you have the keyboard, the drums and all these things picking up on a different monitor, it confuses the house mix. So especially in the Jazz Café [shows in the U.K. with Mad Professor], I’m gonna be showing why not to do it. Scientist: ‘Cause here’s what: you have the guitar amplifier on stage, the engineer at front house position, he can’t accurately tell what’s coming through the guitar amplifier from what’s coming out of the house [amplifier]. Because one of them [is] always going seconds behind, milliseconds behind. So I’m gonna be teaching more on that like I did in Brazil. Waiting on some editing to get done. And you’ll see some stuff that’s talked about for the first time. Like I say, I don’t know why this profession choose me. It choose me more than how I choose it. And thank Almighty God for life.